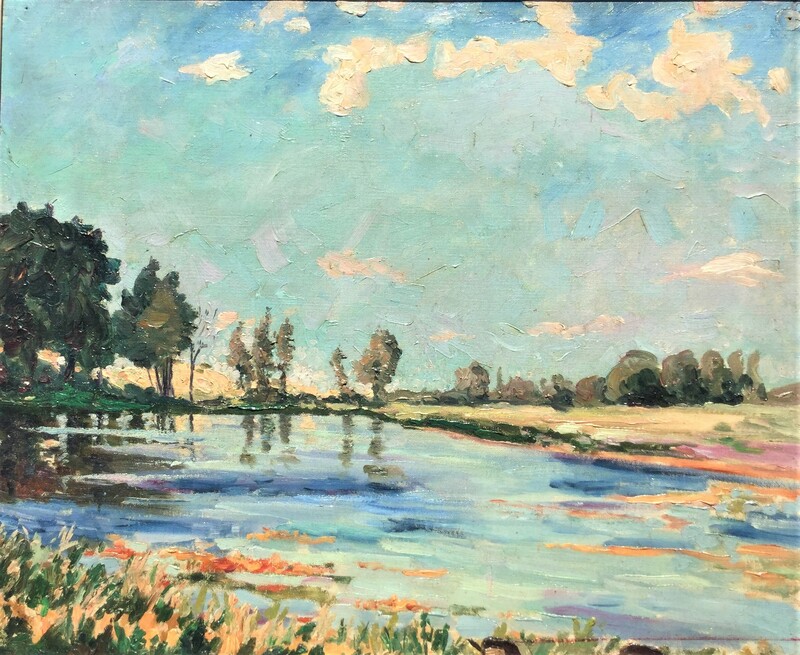 An exquisite painting by Sir Winston Churchill titled Lake Scene at Norfolk has been donated by the Monsanto Company to the National Churchill Museum. The circa 1935 painting – titled Lake Scene at Norfolk – was unveiled during a brief ceremony at the museum on June 8, the 103rd anniversary of Churchill receiving his first set of brushes from a sister-in-law, Gwendoline Churchill, according to records. She had encouraged Churchill to start painting to escape the pressures of politics, according to historian Timothy Riley, Sandra L. and Monroe E. Trout Director and Chief Curator of the National Churchill Museum. Lake Scene at Norfolk is a 20” x 24” oil on canvas painting of a tranquil scene of a tree-lined blue lake in Norfolk, located on England’s east coast along the North Sea. Among the painting’s exquisite attributes is the fact "it clearly shows Churchill’s keen attention to reflected color and light on water. He was a powerful observer of the natural world,” Riley said. The painting was acquired in December 1993 by Monsanto from Edwina Sandys, Churchill’s granddaughter and a noted artist, who said the rarely seen painting was exhibited briefly at a Churchill exhibition she organized with her sister, Celia, in New York City in 1983. Lake at Scene at Norfolk will join three other Churchill paintings that are on permanent display at the National Churchill Museum. In addition, since 2015, the Museum has cared for 16 other Churchill paintings on loan from the family of the late Julian Sandys, a grandson of Churchill and the brother of Edwina and Celia Sandys.